Pelvic insufficiency fractures are common in elderly patients. Because both osteoporosis and metastatic disease occur in similar patient populations, insufficiency fractures may be mistaken for metastatic foci. Although the ilium is not an uncommon location for metastases, insufficiency fractures rarely involve the ilium. The radiological features of insufficiency fractures adjacent to the sacroiliac joint (superomedial ilium) have not been well described. 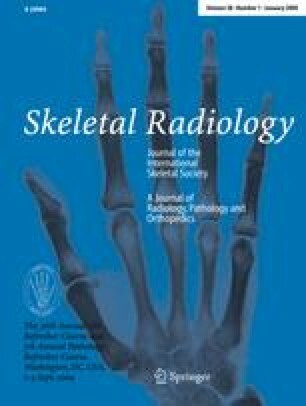 We describe the computed tomography (CT), magnetic resonance (MR), and positron emission tomography (PET) imaging findings of these rare fractures. Six patients (five female, one male; mean age 66 years, age range 47–83 years) with iliac insufficiency fractures adjacent to the sacroiliac joint were identified following retrospective review of a clinical database. Imaging studies, including CT (n = 4), MR (n = 3), and PET (n = 2) were reviewed by two radiologists. Tissue biopsy result was available in one patient. CT demonstrated subtle fracture lucency (n = 2) or linear sclerosis (n = 3) adjacent to the sacroiliac joint; MR marrow changes adjacent to the sacroiliac joint demonstrated a low T1, high T2 signal intensity line (n = 2), or a low T1 and low T2 signal intensity line (n = 1). Fractures were fluorodeoxyglucose avid (n = 2) with average SUVmax 2.2. Iliac fractures were bilateral in three patients; additional pelvic insufficiency fractures were present in one patient. In one patient, CT-guided biopsy showed no evidence of malignancy. Recognition of the radiological characteristics of iliac insufficiency fractures is important in order to distinguish them from malignancy. The presence of additional pelvic fractures in characteristic locations in the setting of osteoporosis may help to confirm the diagnosis. The authors wish to thank Dr. Panna Desai for assistance with histopathology slides.